Andrea Geile trained in printmaking before studying Art/Sculpture in Hanover, Germany. She has been working from her Edinburgh studio since 1995. 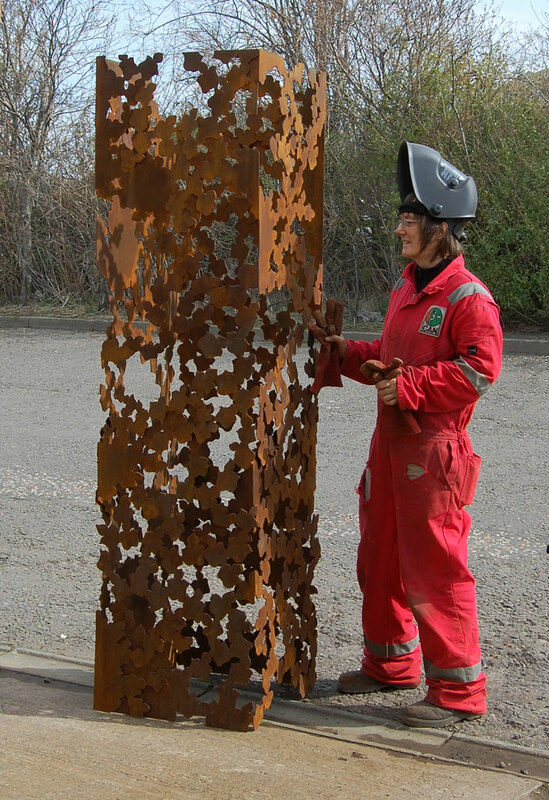 Andrea’s sculptures are made from everlasting corten steel, a weatherproof, clean and no maintenance material. She fabricates all art work in her studio, using hand-cutting and welding to create the intricate patterns. By tracing the shapes of objects, handwriting and plants into metal, she creates sculptures that comment on technology, nature and the human touch. The art work is often grouped with real plants creating a contemporary version of ‘Gartenkunst’, which challenges existing notions of ‘garden art’ and ‘land sculpture’. Her organic and architectural forms merge with the planting and form a symbiotic relationship. Her sculptures and live events condense and interpret nature and ecology. Both her permanent and transient work explore how social processes have shaped and utilized landscapes for our political, economic and immaterial needs. Among others Andrea has received Awards from the Royal Scottish Academy, Visual Arts Scotland and the RHS Chelsea Flower Show. She exhibits internationally and her sculptures are in many private and public collections. Andrea often works to commission.